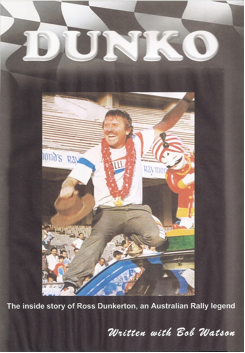 Dunko - The greatest story ever told .... about a rally driver, that is! DUNKO - the inside story of Ross Dunkerton, an Australian rally legend- has been written by another former Australian Rally Champion, Bob Watson. Watson co-drove for Dunkerton over a six week period in the 1977 Singapore Airlines London to Sydney Marathon rally. Ross Dunkerton is five times winner of the Australian Rally Championship, twice winner of the Asia Pacific Rally Championship and winner of thirty seven International rallies, but he is much more than that. Dunkerton is a successful businessman, highly respected after dinner speaker, television star in his native West Australia, famly man and raconteur extraordinaire. He is a larrikin who has achieved major success as well as surviving two serious accidents and nineteen roll overs. This book traces Dunkerton's lifelong passion for rally driving, his adventure in Australia, India, Malaysia, Indonesia, and on marathon events including London to Sydney, London to Mexico and Hong Kong to Beijing. The book is liberally laced with Ross's hilarious anecdotes and almost 100 exceptional photographs. DUNKO will be formally launched at Rally Calder, the first heat of the 2012 Australian Rally Championship on March 2-4. "This book is a genuine and sometimes very raw and controversial portrayal of a true legend of Australian rallying, and also Australian sport. It is a gripping account of the life of a person who didn't accept failure, yet admits to being far from perfect. I would encourage all budding rally and sports stars to read this book to see that sometimes success in sport and life is not a god given right, but earned".